For true wilderness cruising at high southern latitudes, nothing beats a trip around the bottom of Tasmania to it's rugged SW corner . There's been a large time gap in cruising stories on illywhacker's website. About 6 years in fact. That's the time it took me to adjust to Lyndall's developing illness and following her passing, to build a new life in a new place. If you thought building a yacht and sailing to Alaska could be difficult, try adjusting to the loss of a partner of 50 years. It's another paradigm altogether. So it has been rather a surprise to me that I am very much enjoying each day in my new port of Kettering in Tasmania (43deg 07S, 147deg 15E). 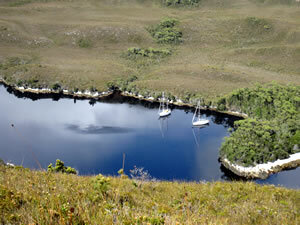 It is the home of wooden boats and serious cruising yachts. The locals are fishermen and farmers who do all they can to help newcomers from the "mainland" like me, settle in to the "Tassie" way of life. It is certainly a different climate from Australia's tropical north. The weather can be a little brisk - given to sudden changes, with sharp winds from the Antarctic nearby but often there can be warm days and magnificently clear skies. Illywhacker and I are adjusting to the climate but things are made easier by the fact that one of the great features of Kettering is it's location within the D'Entrecasteaux Channel, a truly great cruising ground with many secluded anchorages. 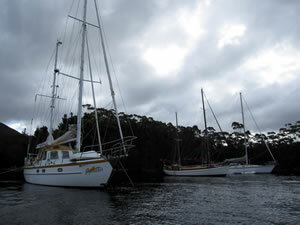 Port Davey is a remote location but it's just a day's sail from the shelter of the Channel. The best time to attempt the passage is in the Feb/Mar period, which is when Alison, my crew and another yacht, SiIver Air with old cruising friends John and Dee Deegan aboard, made the passage. 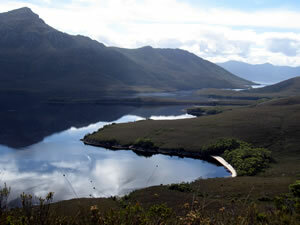 The topography of the coastline around the south of Tasmania to Port Davey is rugged. Recherche Bay is the last anchorage at the south of the D'Entrecasteaux Channel and further south from there is uninhabited. Fishermen looking for crayfish and abalone use the several bays there for shelter from NW'ly winds but these swing through the W to SW and mostly these anchorages are untenable. 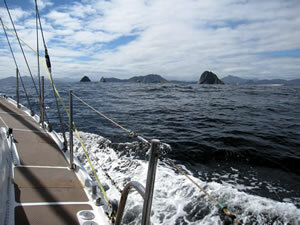 From the safety of Recherche Bay, one should plan to sail the 80nm distance when the weather offers a 12-hour break. We waited for a good forecast and had the pleasure of a fine sunny day as we traversed Tasmania's southern shoreline, motorsailing. Illywhacker now has a new 70hp Yanmar which helped to ensure our arrival at Bramble Cove in the shelter of Port Davey, well before dark. A cold front forecast however, convinced us to move further inland and we travelled east, following the Bathurst Channel seeking protection from the predicted westerly blow. First stop was Wombat Cove where the special nature of the area became apparent. 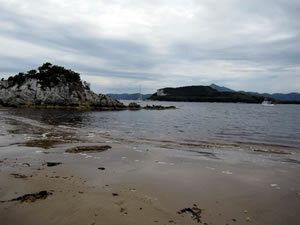 Port Davey is the name of the outer basin on Tasmania's SW coast. A number of anchorages allow dinghy exploration adventures as well as excellent fishing there and up at Payne Bay in the north. From this large bay, the Bathurst Channel heads east for some 7nm to Bathurst Harbour. 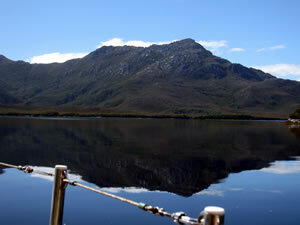 From Bathurst Harbour the Melaleuca Inlet runs SE for 5nm to a lagoon of the same name - a very remarkable place with a fascinating history. As illywhacker entered the Bathurst Channel the colour of the water darkened to a rich red. 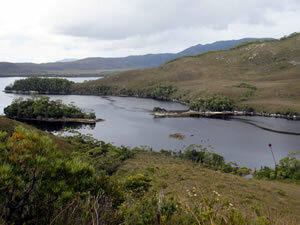 The tannins from the low shrub and grasslands of Bathurst Harbour are responsible for colouring the top layer of fresh water which blocks light from entering the salt water below. The further along the channel we motored the darker the colouring and the deeper the top layer of fresh water became. It seems that saltwater species of sea life, both plants and marine creatures, have evolved into strange forms and a dive below is an amazing experience. Our adaptability to cold water diving is yet to be refined - hopefully next year we will be better prepared. So few visitors have traversed the area that unique plants and fauna survive on land as well. Hence the area is heritage listed both above and below the waterline. 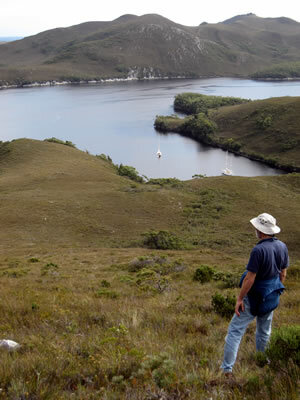 Hikers have the option of a rugged 7 or 14 day trek into Bathurst Harbour and daily flights ferry visitors to and from selected viewing areas. Parks people have developed strategies to minimise adverse impacts by these groups as well as yachts. 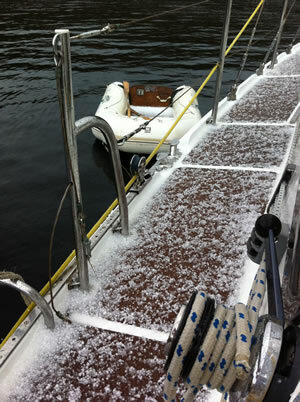 Within the channel and Bathurst Inlet, yachts must refrain from any discharge, anchor in designated areas and carefully wash boots before going ashore. It is a place well worth protecting. We definitely want to go back.